Welcome to my next Let's Read! 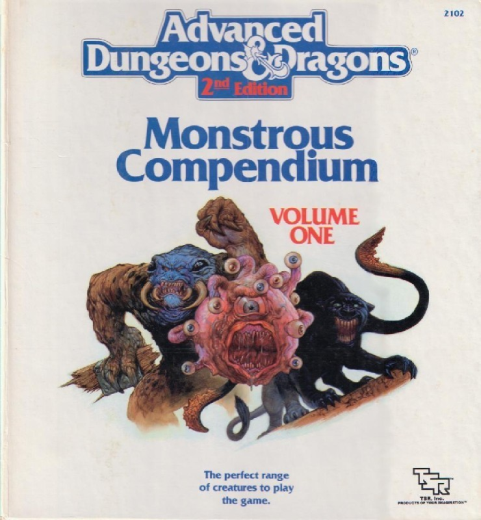 This time, we will have a look at the very first AD&D 2e loose-leaf collection: The first Monstrous Compendium Appendix. This MCA is setting-neutral and covers the classic D&D monsters. Say hello to a trio of non-OGL critters. I've always found the color used for the beholder on this cover to be a rather... unfortunate choice. Though it explains why the beholder looks so pissed off... it's been skinned. Not me, I love these designs. I love the peeled grape Beholder, I love the death's head grinning displacer beast, and I love, LOVE the huge baboon Umber Hulk (This will always be the Umber Hulk to me, forget the third edition insect creature). ... and I love, LOVE the huge baboon Umber Hulk (This will always be the Umber Hulk to me, forget the third edition insect creature). * See the eyeholes in front, so he can peek out? A peeled grape is not what it makes me think of. The displacer beast and (especially) the umber hulk look very cool, however. Here's our first monsters: The aerial servant, an air elemental summoned by the spell of the same name. 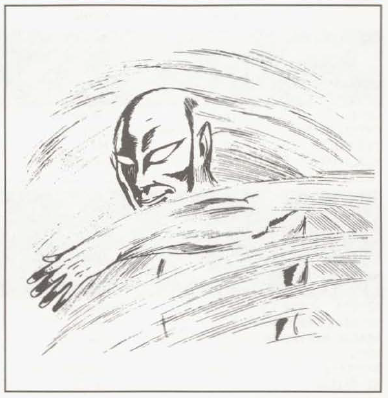 The artwork is so-so: The servant looks adequately alien, but the motion lines make it look like a half-hearted attempt at discus throwing. It also looks pretty clear for an almost invisible creature consisting of blue smoke. Anyway, the aerial servant is immune to mundane weapons (I remember that) and has a sixteen hit dice (I didn't remember that). That's a lot. In combat, an aerial servant strangles its opponents. To have a good chance of breaking free, percentile STR is needed, so let's hope your fellow adventurers grind though those sixteen hit points. I don't really like that the grab mechanics is based on ability scores, as many aerial servants will probably be summoned by the players against monsters, not the other way around. Then again, the servant can turn on its master, or maybe it's just me who's not using enemy aerial servants. The aerial servant's actual purpose is that of a beast of burden, as it won't fight for its summoner anyway. On their home plan, aerial servants explore the "infinite mysteries of their native planes" (despite being semi-intelligent). Yeah, maybe in the Astral or Ethereal Plane, but from what I know, the Elemental Plane of Air consists of infinite boredom. I like how the MCA plays it straight an points out that aerial servants have no dwellings and no natural enemies. I'm not sure whether anybody ever complained about the lack of information on the Air Plane food chain. Bottom line: The aerial servant is what it is supposed to be: A summoned monster. Apart from that, there's not much to it, but I kind of like elementals being rather vaguely described anyway. I was recently comparing some 1st edition stats to the 2nd edition incarnation and noticed a number of monsters got massive boosts. Maybe that is where the 16 HD came from?